Chronic Obstructive Pulmonary Disease (COPD) and Congestive Heart Failure (CHF) are progressive diseases and often the terminal stage of heart and lung disease, leading to death and disability. Both of these diseases may manifest with similar conflicting symptoms such as shortness of breath and cough. Patients tend to find coughing the most embarrassing and disruptive of these symptoms. Coughing can interfere with social events, like going to the movies, and it can prevent subjects from falling asleep at night. The American College of Chest Physicians guidelines on cough recommends assessing and monitoring cough severity. However, there is a lack of evidence on cough as an early symptom of decompensation in COPD and CHF. Smart-phones today come with advanced microphones to record audio data sensed by the in-built microphone. In addition, digital signal processing enables to calculate characteristic of sound occurrences to classify cough and non-cough events using machine learning algorithm for pattern recognition. Fig. 1. Zero Crossing Rate of COPD, CHF and Controls Cough Segments. This paper explains the development of a smart-phone based “TussisWatch”, a low cost, easy to use in-home system to detect cough patterns for better home monitoring by individuals. Our goal was to count total number of cough episodes and cough frequencies as a function of time using audio processing. This process ultimately resulted in the development of algorithm to differentiate coughing pattern in both COPD and CHF or non-disease following a work flow process. Our team collected a total of 82 segments of cough that were actually symptomatic of COPD and 47 segments of cough symptomatic of CHF and 81 segments from healthy adults for comparison. Cough data from the participants were extracted as segments of audio files using several well-known features (i.e., Zero Crossing Rate, Spectral Centroid, and Mel Frequency Cepstral Coefficients) as depicted in Figure 1. We used a process called Synthetic Minority Oversampling Technique (SMOTE) to fix noises and imbalances in the sound files. A Random Forests based machine learning algorithm was used to create rules for decision support. Further, a two-level classification scheme was used to test correctness and recall. Specialized statistical and mathematical calculations called F-Measure and Confusion matrix helped the team to develop algorithm the, a process to differentiate coughing pattern in disease (COPD or CHF) or non-disease. The entire data set was divided into 10-subsets to carry out a 10-fold cross validation system to evaluate 10 times. Each time, one model is used to test or validate the model, while the nine subsets were used to train and build a decision model and arrived at an average error across all 10 trials. This entire process is called machine learning algorithm. By employing the 10-Fold cross validation a Sensitivity of 80%, Specificity of 82% and an Accuracy of 80.7%. While testing small sized datasets, the variances are higher, but they start to decrease with more datasets as we added 10% of dataset at each level and tested them at levels. Beyond 70% of datasets, the variances became stable and are very low. 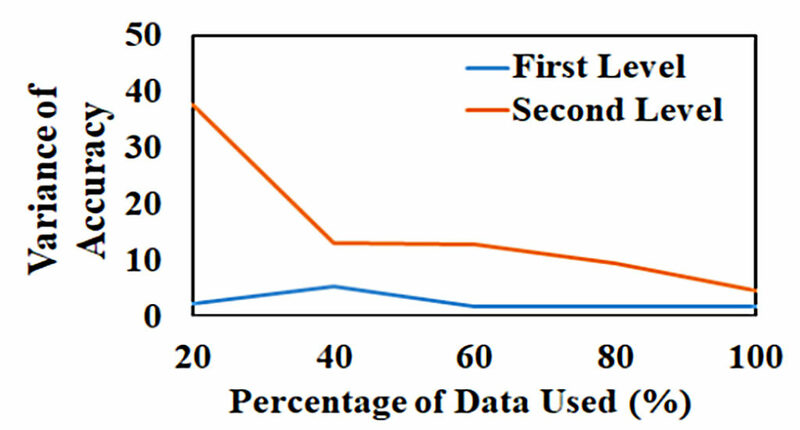 This, we believe, gave us confidence on representativeness of our datasets at both levels as indicated in Figure 2. Fig. 2. Variance Trends for Different Subsets and Two Levels of Validation. The features used to differentiate CONTROLS cough from DISEASE (i.e., either COPD or CHF) better, but there was significant confusion between COPD and CHF cough. However, the 10-Fold validation numbers are highly encouraging for practical deployment and potential extensions of our TussisWatch system for better monitoring of cough. In future studies, we proposed to design personalized models to enhance classification accuracies and attempt more complex problems like evaluate the impact of an intervention (e.g., an inhaler use in COPD). TussisWatch: A Smartphone System to Identify Cough Episodes as Early Symptoms of Chronic Obstructive Pulmonary Disease and Congestive Heart Failure.